In the 40 years that we have been involved in pigeon racing we have regularly experienced some new theories, each of which were said to be infallible. Nevertheless, each of these theories found their way to the paper basket, because they did not work out in practice. A pigeon fancier who lives for his pigeons, who studies and investigates all suggested theories will be sceptical and prefers not to be influenced by new theories. Young, novice fanciers who like to skip stages on their way to success, because they want to be at the same level as the more experienced fanciers as quickly as possible, will have a different take on these theories. To reach their objective more quickly and with less effort, they tend to believe that success in pigeon racing is the result of a particular feature you have to be aware of, or a secret that needs to be discovered first. We would like to address these novice fanciers and all readers in general who are easily influenced by these new theories and we would like to warn them. That is why we give you the following example of someone who tried to take advantage of less experienced fanciers. We hope the following story will help to avoid such situations. One day, a pigeon examiner came into a pigeon club headquarters in a neighbouring town. The pub owner had announced the event and a great number of fanciers from the area were enticed to the venue. It was a full house and the examiner had quite some success: he made a diagnosis and he gave some very positive reviews of the pigeons that were shown to him. 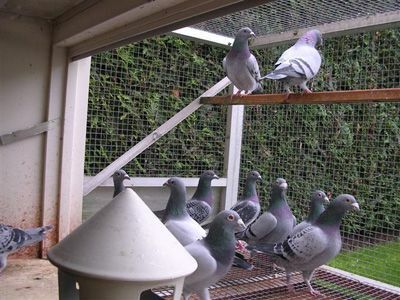 “This is an excellent racing pigeon but he won’t be a good breeder. He will be good in races of up to 150 km only. This pigeon here can fly all distances but you should not keep any of the youngsters it breeds. This pigeon is bred from two yearlings.” He had an unshakeable belief in his own truth, which is why he believed that everything he said was true. Unfortunately for him it did not last long. All of a sudden there was an argument with one of the fanciers, who simply could not agree with the verdict of the examiner. The fancier had brought ten pigeons and the examiner was confident that one of these birds was not a good breeder. The owner of that pigeon was perplexed: that very pigeon was in fact the sire of four excellent pigeons, which the examiner believed to be four outstanding pigeons. It was this joke that put him in a difficult position: it proved that his secret theory was of no value. Still, we do not want fanciers to lump all examiners (keurders in Dutch) together. We know several outstanding examiners who do a great job, not only for the fanciers but for pigeon fancying in general. Just to mention a few: Rene Genette and Omar De Keyzer both have a great knowledge of pigeons and they have proved their skills many times. Their proficiency makes them one of the top examiners in pigeon racing in Belgium. Obviously they do not work for free but they are worth every penny. There are several more examiners in Belgium who give valuable advice as well. This story should make clear that there are people who try to take advantage of inexperienced and credulous fanciers. This is regrettable because they undermine the reputation of the examiners who deliver great work. These fraudulent people undermine the future of the younger generation. As we said, there are great examiners out there who know everything about the pigeon. They give you an honest opinion about your birds and they will not keep secrets. We cannot stress enough that there are no secrets or miracle methods to assess the racing or breeding quality of a pigeon. A good knowledge of pigeons is not the result of an accidental discovery or some sort of secret. There was a referendum (the results of which were published), which offers solid proof again. It is a lengthy study that is based on scientific research, new observations and examinations in pigeon racing. If we want to safeguard the future of our sport, which some are rather pessimistic about, we have to rely on several thousands of new fanciers to fill the empty spaces, of which the number increases every year. In other words: the majority of pigeon fanciers are part of the older generation. So only the novices and the new starters are likely to fall victim to this kind of fraud. Some of these newcomers have only just found their way to pigeon racing when they come into contact with people who try to take advantage of them by selling stories. Many inexperienced fanciers follow their advice. When they notice that their approach is not successful they sometimes leave the sport disillusioned. This is only because they took the wrong path. That is why we think it is in the interest of our sport and its future to make clear to these newcomers that there are no secrets or magical means in pigeon racing, despite what some frauds want you to believe. The road to success is very difficult and complicated and these difficulties are what make our sport so interesting. As a fancier you learn to be patient, you learn to observe and to be strict in a way you would never imagine. It is important to remind the newcomers that our sport is more than any other sport an educational journey, which all fanciers go through. Many fanciers have learned important lessons while spending their time in the quietness of the pigeon loft. These experiences are much more valuable than any theory. If you want to succeed and keep succeeding you have to become a skilled fancier. To achieve this you need some indispensable knowledge that should be learned as soon as possible. This of course does not mean that only the older fanciers can become successful because they are more experienced. This is far from the truth. If a younger fancier knows the same about pigeon fancying as an older fancier he will be likely to beat the older fancier, because he can put more energy into his hobby than the older fancier, who might not be making any improvements in his game anymore. In pigeon racing the future champions and the best teachers were once newcomers themselves. This should be encouraging for the young fanciers among us who are reading this article. The future of our sport cannot depend on champions on the wane. Instead we need to focus on new fanciers with a thorough knowledge who are acquainted with the difficulties of our sport. With a patient approach they can succeed as a fancier as well. These reflections force us once more to be aware of people who try to take advantage from newcomers. They try to convince others that they have the ultimate solution to become successful. Their aim is to make money and they do not care about our sport. We will continue to keep them away from our sport. These frauds have a wide field of action because they are often supported by barkeepers or club owners as well, as they benefit from it too. The quacks are not very popular, that is why they do not come to the same towns very often. If the barkeepers want to make extra money they have to invite a new examiner every year. As a result the frauds have the opportunity to visit one town after the other throughout Belgium, to take advantage of credulous newcomers and the less gifted fanciers. We apologise once more for the good examiners out there who know their job and who will always give their honest opinion. Still, we should be aware of the deplorable people who do our sport a lot of damage to their own benefit. In the interest of our numerous readers, we will do everything we can to defend fanciers against these people. If we would hide the truth to win the favour of our readers and if we gave them false information they would no longer trust us either. We like to do research and we experiment regularly. We are on the lookout for innovations. We do not pretend to come up with new theories or truths and we will never give incorrect information. We have good intentions, contrary to the frauds we have been talking about. They want you to believe the opposite of what we say and they focus on certain features or peculiarities of a pigeon. They say all the rest is of secondary importance. On the other hand, pioneers are always useful and they are often undervalued. We should encourage pioneers as much as possible. That is why we have been following the research that was conducted by the late Prof. Capart, a good friend of ours, who wanted to learn more about the orientational skills of a pigeon. He inspired us to take a look at a published study of the wing from a different point of view, which was very interesting. At the time when this study came to our notice, it was considered very important and it was believed to over rule any other theory from the past. Eventually the new theory turned out to be incorrect. Voluntary researchers deserve our respect and sympathy: they come up with new discoveries and any responsible fancier will not take advantage from it until it has proved its value. The least we can say is that the majority of theories that were brought about in the last half of the century were premature. Theory alone has no value; it is the reality that counts. What is the use of drawing up long theories and rules about the eye of the pigeon, when the majority of the pigeons we have seen are an exception to those very same r ules? What is the use of emphasising that the length of a pigeon’s wing should be 25 or 26 cm? If we measure the wings of 25 of the best pigeons in Belgium we would only be able to conclude that each of these pigeons had a different wing length. We might as well conclude that the best pigeon of the group had in fact the shortest wings. We could bring up other examples to make our point but the example we just mentioned should be enough for those willing to listen. Any theory will be useful only if it works out in practise. We should always be careful when it comes to new theories. If a theory proves to be wrong it will be known to the public sooner or later. Imagine we had the opportunity to visit a large show, where only the very best pigeons are shown. Do you honestly believe that after we have examined each of the pigeons we would come up with a great discovery about the pigeons, a feature all of these pigeons have? There are pigeons of all sizes and colours, some are small, some are big and some are medium sized. The tint of their eyes is so different that if a painter had to make paintings of them all, he would be obliged to use the whole range of colours available. Some are straight; others have a deep keel. If you weigh a pigeon when you measure the length of their wings you will find that there are many differences, both in length and in weight. The same applies to the size and shape of the muscles and the breastbone. We could go on and on. But what does it prove? That the sportive value of a pigeon doesn't arise from one or other section of its individuality, but that it forms in its entirity a wonderful equilibrium, of which the perfection decides its class. The proof of what we have written down, was brought to us in 1952 by the judging in IVth show of the Belgium racing pigeon. This material proof, which we established after judging 25 of the best Belgium pigeons, put all exclusiveness aside and will stop all fanciers, even if hè is just an ordinary foncier, a champion or a chronicler, to be stubborn. We will assure our young readers, that study, practice and experience count. It proves that the true qualities of a pigeon are not the result of one or other feature or characteristic; it is the result of the pigeon as a whole, where every aspect is in perfect harmony. We found evidence for our theory in 1952, when the pigeons of the IVth show of pigeon racing in Belgium were being examined. Twenty five of the best Belgian racing pigeons were examined. It illustrated that only a few privileged examiners were able to correctly assess the value of a pigeon. Only they will be able to give valuable comments about a bird. Some of these examiners will make 20 mistakes per 100 pigeons, some make 15 mistakes and the very best will only make 10 mistakes. Keep in mind that there is never one single correct assessment. We can prove this to anyone who wants to know. A pigeon can have the outer qualities of a top class pigeon although it is in fact a very average pigeon. Remember that even the best examiners can be wrong once in a while. facteur : " CHANCE ".